Discovering that spaghetti squash can form the base of a casserole was definitely a turning point in my dinner making career. 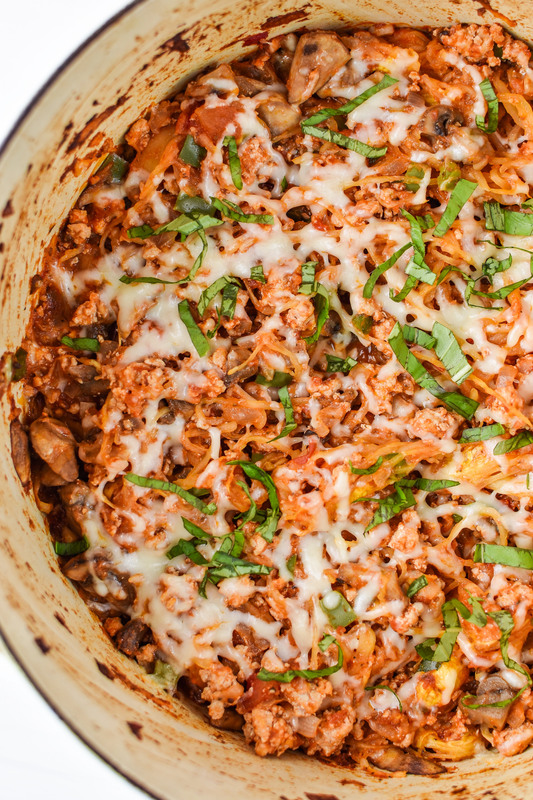 The first one I ever tried was this Buffalo Chicken Casserole from PaleOMG. Can you say life-changing?? It’s like I never even knew I was missing the pasta part of the meal. Have I mentioned I love pasta? So that was a couple years ago now (maybe even three or four…) and my love of spaghetti squash has deepened. My husband is incredibly fond of my Meat Lover’s Spaghetti Squash Pizza Casserole and the Pesto Chicken Stuffed Spaghetti Squash. This spaghetti squash season, I had an epiphany. Spaghetti… spaghetti squash! Okay, this is not a NEW thing, but new to me. So I tried a simple recipe just to see if we would like it: spaghetti squash, red sauce, meat and cheese, all baked together. And we loved it! I made a few modifications, added some veggies, and here we are. 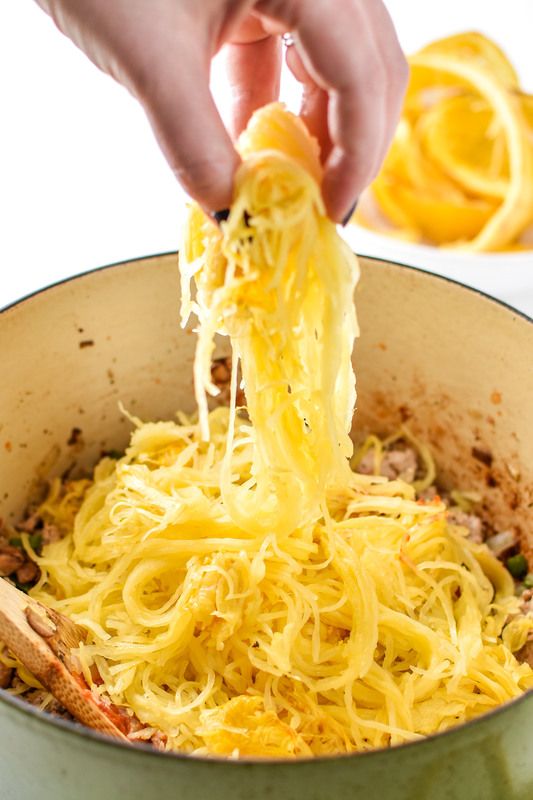 How do you cook spaghetti squash for spaghetti? When I first set out on this spaghetti squash spaghetti quest, I remembered reading a very detailed post on How to Cook Spaghetti Squash from Pass the Plants. My biggest takeaway from her article was this: Cut the squash widthwise instead of lengthwise to get longer strands. This makes perfect sense once you think about it. Cutting the squash lengthwise literally chops every spaghetti squash strand in half. Cutting widthwise is cutting with the direction of the strands, instead of chopping them all in half. Normally, this isn’t a huge deal for me. I don’t mind shorter strands. But when it comes to spaghetti, I feel like longer strands make the final dish a little more authentic and “spaghetti” looking. If you don’t care about the strands, cook the spaghetti squash however you want and ignore my instructions. But if you like to twirl your spaghetti, cut widthwise!! Using a fatter squash will give you longer rings. I cut my squash into four rings total. Besides cutting widthwise into rings, my suggestion for better spaghetti-like strands from your squash is to salt the spaghetti squash rings for about 15 minutes prior to baking. 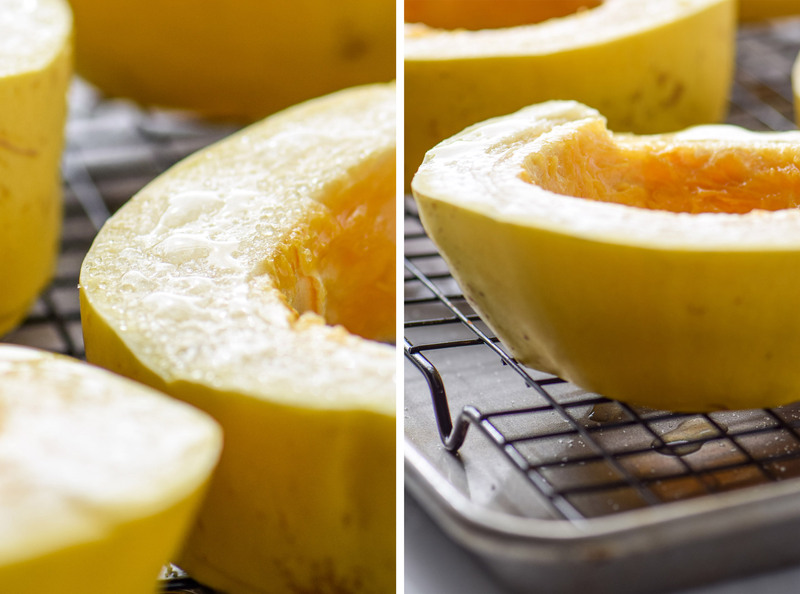 This will help draw moisture from inside the squash, which you can wipe off before baking. Your spaghetti strands will be more noodle-y and less mushy if you do this step! 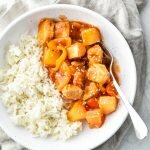 It’s the same concept as salting meat, however in this case you do not want to moisture to soak back into the squash, so 15 minutes is all you need. Look how much moisture came off the squash in such a short time! How do I know when the squash is done? The spaghetti squash can take anywhere from 30 minutes in the oven when thinly cut, to around an hour depending on size. You’ll have to check your squash individually to be sure it’s cooked through. When cooking squash as described above (cut into rings), I cooked my squash for nearly 45 minutes. I took the squash out of the oven and used a fork to check how easily the strands peeled from the skin of the squash. It should be easy enough to pull strands away with little force. I did notice that because of the pre-bake salting, the squash was drier than other squash I’ve cooked (this is what we want!). However, it can make the squash appear a bit undercooked. If the edges are browning and you can easily pierce the squash with a fork, it should be done cooking. Once the squash is done cooking, you can remove the strands and place them in a bowl, or you can set the squash aside for now and then put the strands directly into the baking dish from the skin when it’s ready (pictured below). 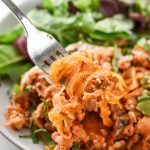 Can the Spaghetti Squash Spaghetti Bake be modified for Whole30 or paleo diets? 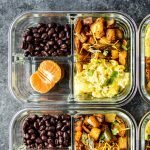 You may have heard, I’m going to be doing the Whole30 program in January! 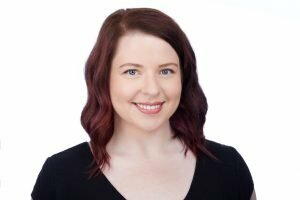 Right now (in October), I’ve been reading the Whole30 books and website, cooking Whole30 recipes, and thinking about how my current recipes could be modified to follow the Whole30 diet. Based on my understanding, the only thing about this recipe that disqualifies it from being paleo or Whole30 is the cheese. Dairy is a no-go on either of those lifestyles. 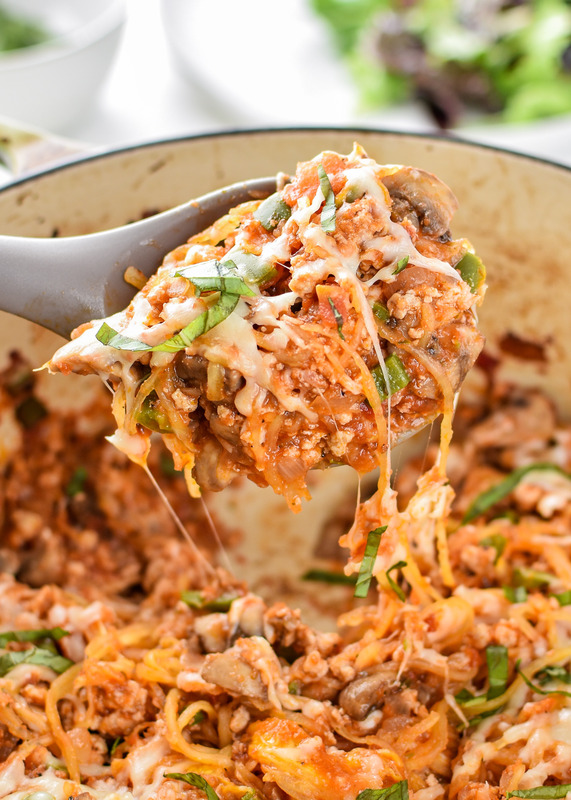 Eliminate the cheese from the recipe, and I think it would qualify as paleo and Whole30. You should also confirm that your red sauce is Whole30 compliant (no added sugar). 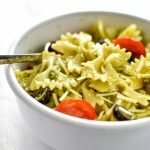 In this recipe, I used the Organic Marinara from Costco, which appears to have clean ingredients to me. How many net carbs does this meal have? The days of my Atkins dieting are finally paying off! The diet never stuck, but at least I know how to count net carbs. Net carbs are the total carbohydrates minus dietary fiber and most sugar alcohols. When following this formula, one serving of this recipe has 14g total carbs and 10g net carbs. I’m basing the “low carb” description on a daily consumption of up to 50g net carbohydrates. Please note that I’ve estimated all nutrition information based on the brands and ingredients I’ve used. 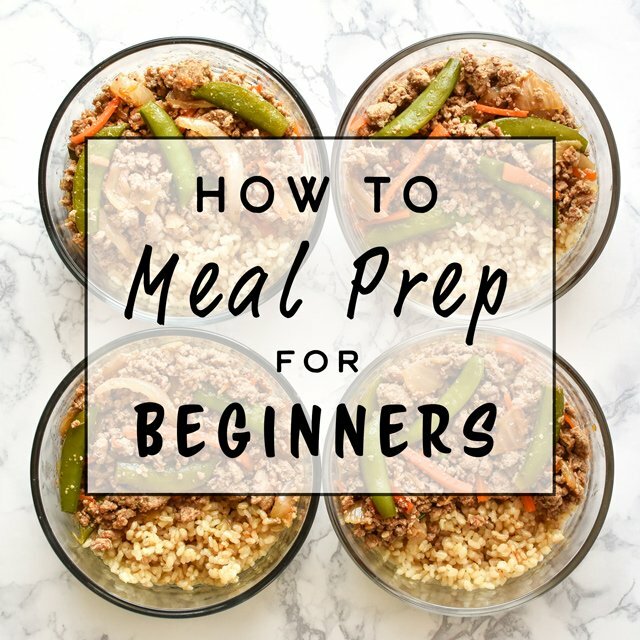 I would encourage you to do your own calculations based on your own ingredients used. 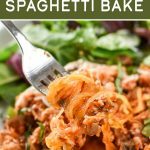 Can the Spaghetti Squash Spaghetti Bake be made-ahead or meal prepped? Yes! This is an excellent make-ahead and reheat dinner. Spaghetti squash noodles hold up surprisingly well, and in my opinion better than some brown rice or odd grain noodles. This meal would also work well for make-ahead lunches. Once it’s cooked and cooled for a bit, portion into 4-cup Pyrex round glass containers (affiliate link!) or simply place into any large airtight container with a lid, and store in the refrigerator for up to 4 days. To reheat, simply heat a portion in the microwave, loosely covered, for 90 seconds. Can this dinner be made-ahead and frozen? I would not recommend making and freezing this dish, as the squash noodles may not be in the best condition after thawing. Stick with the refrigerator for this one. One option to help save time with this dish could be to make and freeze the meat, sauce and vegetable mixture. The meat would freeze well and would easily thaw. 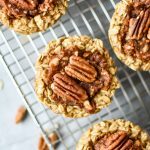 While this may not be the best option for some, it would save steps and leave you with only the squash and final bake to deal with. Additionally, you could use this frozen mixture for regular spaghetti noodles, or another dinner recipe if squash is not available. 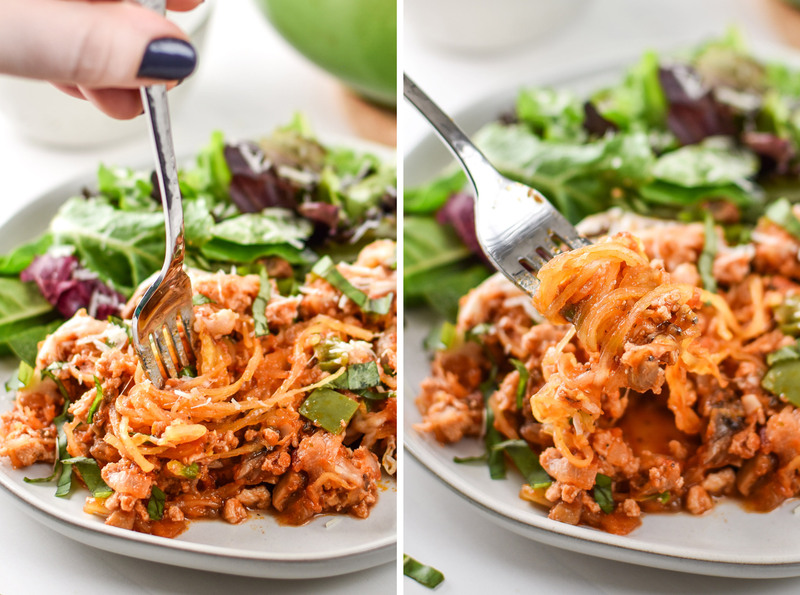 If you’re obsessed with squash noodles as much as I am, then you will absolutely love this Low Carb Spaghetti Squash Spaghetti Bake. 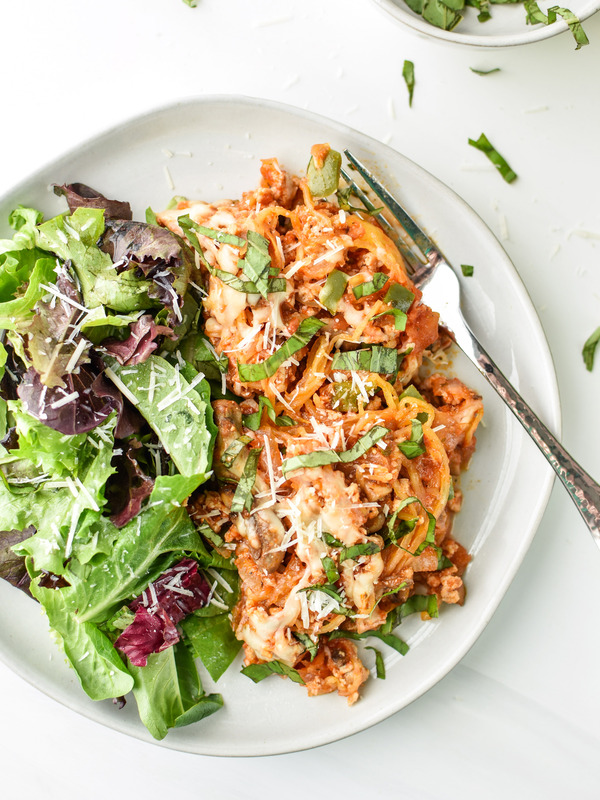 It’s packed with veggies, perfect spaghetti squash noodles, and has only 10g net carbs! Optional: Lay cut squash rings out on a baking sheet lined with a rack. Sprinkle both sides with salt and wait 15 minutes. Wipe away all salt and moisture that has come from inside the squash, then proceed with recipe. This helps form more “noodle-y”, less mushy, squash strands for spaghetti. Preheat the oven to 400F. Bake squash rings for 30-45 minutes on a lined baking sheet, or until fork tender and strands pull away from the skin easily. Set aside to cool. Heat an oven safe skillet or Dutch oven over medium high heat (if you do not have an oven safe skillet, use any pan and then be sure to transfer to an oven safe dish for the final baking step). When hot, add ground turkey and onion. Season with 1/4 teaspoon each salt and pepper. Use a wooden spoon to break apart the meat, then stir occasionally and cook for about 8-10 minutes, or until the meat is fully cooked through and onions are translucent. Remove the meat and onions from the pot and set aside. Reduce heat to medium. Add remaining 1 tablespoon oil, then add mushrooms and green peppers. Cook and stir occasionally for about 5-7 minutes, or until the mushrooms have released some moisture and cooked down. Add garlic to the pan, stir and cook for about 30 seconds, or until fragrant. Remove the pot from heat. Return the meat and onions to the pan, then add red sauce, italian seasoning and 1/2 cup mozzarella cheese. Use a fork to pull all the spaghetti squash strands away from the skin of the baked squash and add them to the pot as well. Stir everything together until well mixed. Top with remaining 1/4 cup cheese. Bake in the 400F oven for 12 minutes, or until the cheese is melty. Top with fresh shredded basil before serving, if desired. 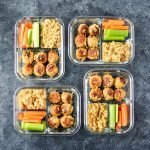 Serve immediately or store in an airtight container in the fridge for up to 4 days. This dish makes excellent leftovers (reheat portion for 90 seconds in the microwave on High). 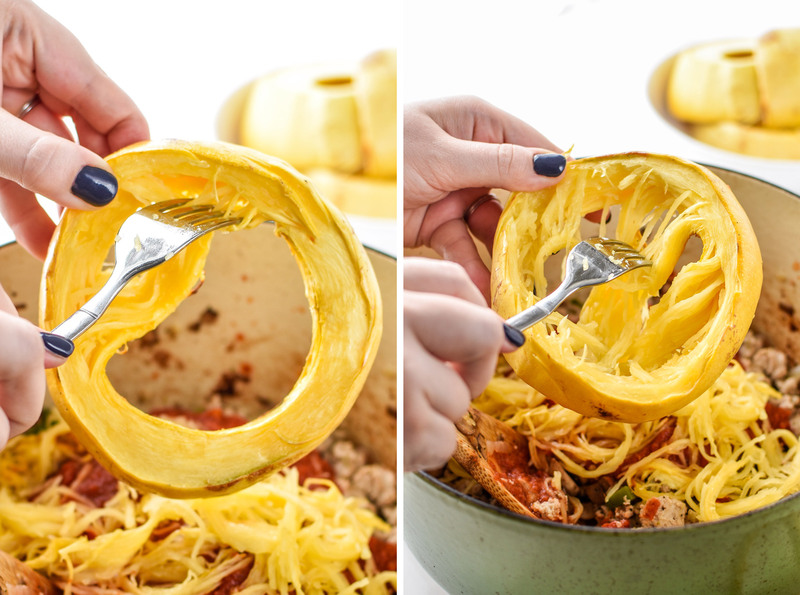 Squash: For the longest spaghetti-like strands possible, cut squash widthwise into rings. See above post content for an explanation and photos. Method of cooking squash from Pass the Plants, How to Cook Spaghetti Squash. 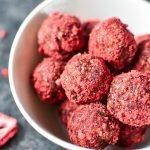 Each portion contains 10g net carbs. “Low Carb” description is based on a 50g net carb daily maximum. Nutrition information estimated with My Fitness Pal. Please note that I’ve estimated all nutrition information based on the brands and ingredients I’ve used. I would encourage you to do your own calculations based on your own ingredients. 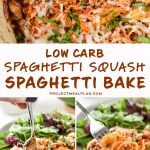 Thanks for checking out the Low Carb Spaghetti Squash Spaghetti Bake! Please tag me or use #projectmealplan on social media to share your spaghetti squash creations! Previous Post: « Store Bought vs Homemade Applesauce: Which is Cheaper? I made this for dinner tonight and it was absolutely perfect! My family gobbled it down! I especially love the hack to bring some of the moisture out of the spaghetti squash, will definitely be making again! Yay Lauren! Thank you so much for trying this recipe! And for your quick feedback that I totally needed, haha. So glad your family enjoyed this. You’re the best! I love spaghetti squash and I don’t know why I don’t cook it often. I love this version with ground turkey. So healthy and delicious!! Thanks for sharing your tips on the process. Can’t wait to try!! I’m always looking for more ways to cook spaghetti squash, especially ways that my squash-averse husband will love, too. I think this would be so perfect for both of us! I think he would love it! My friend Lauren also said her husband doesn’t like spaghetti squash but loved this spaghetti bake. Thanks for your comment Sues!